Hallyu Star, Bae Yong-jun, will be returning to television screens in a new drama series about wine. The show, entitled,Water Drops of God, will hit screen late 2009. The series is based on the original Japanese animation series of the same name and soon became a bestseller, stirring up a newfound interest in wine throughout Japan. The Japanese version begins with an internationally renowned wine critic named ‘Kanjiki Yutaka’ who offers his life’s fortune, including his entire wine collection, to anyone able to find the 12 bottles of wine called the ’12 Apostles’ along with a bottle of wine named the Water Drops of God . This, in turn, triggers a competition between his son, ‘Kanzaki Sizuku’, and adopted son, ‘Tomini Itze’. Interestingly enough, the original authors of this Japanese cartoon, the ‘Agi Tadashi’ brother and sister, modeled the ‘Tomini Itze’ character after Bae Yong-jun. As Bae Yong-jun rested up and received treatments for his injuries during his last drama in 2007,Taewangsasingi , he began studying about wine in order to prepare for the filming of the drama that is slated to begin in early 2009. 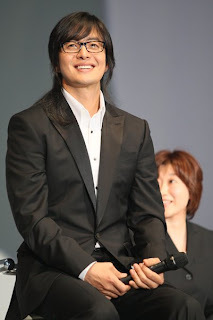 Furthermore, Bae Yong-jun will be returning to supply the voice of the male lead in the animated version of the popular drama Winter Sonata along with Choi Ji-wu. I wish that the series will be earlier than expected because I missed byj so much.Take care bae and I hope someday will meet in person. i believe this film is very good because BYJ always hard , i always clapping. I think this will be a phenomenal korean series of 2009. I can't await to watch it! damn but i just quit drinking ! Hi Bae Yong Jun, nice and happy that fianlly i heard you news again. Hope everythings is getting fine on your treatment and had fully recovered from it. I really miss you and keep searching for your lastest news in website. i miss byg so much! I love you bae yong jun..